Are you ready? It’s time to hop on board our BC Road Trip Time Machine and travel back to 1966. This time we are driving Highway 8 from Merritt to Spences Bridge and Highway 12 from Lytton to Lillooet. 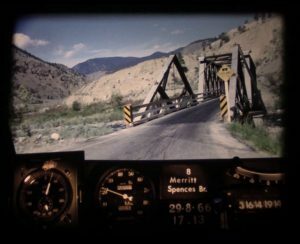 As many of you already know, we’ve been digitizing 16mm photolog footage from 1966 to give you our BC Road Trip Time Machine video series. This is an area of the province rich in history. In fact, Lillooet is considered to be one of the oldest continuously inhabited locations on the continent, reckoned by archaeologists to have been inhabited years by the first peoples of the area for almost ten thousand. Although these roads are off the beaten path and remain low volume routes, we’ve made a number of safety improvements to keep travellers safe. “Photologs” were created to capture road condition information across the province and give our engineers the ability to study a particular stretch of road without having to travel into the field. 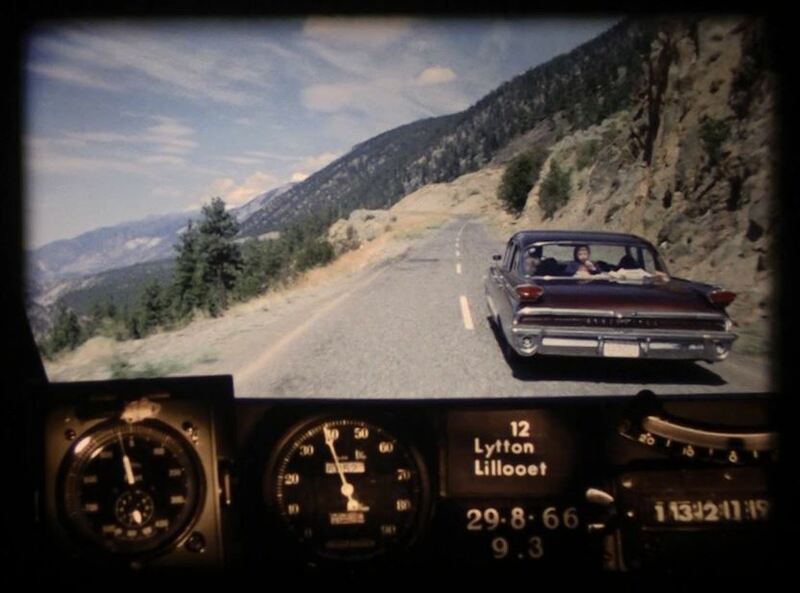 The original photologs were collected by rigging a camera onto the dash of a car that took still images every 80 feet or so and then running them all together as a single film. Pretty cool stuff, huh? Looking back on these old reels reveals a lot more than just pavement condition. The camera captured some incredible glimpses of our province during the 60’s. BONUS! Check out some of our favourite still images from this film and from other photologs. Are you patiently waiting to see footage of a particular BC highway that we haven’t shared yet? Let us know in the comments below. What was the maximum speed limit on Highway 1 from Burnaby to Hope when it opened. I checked with one of our long-time traffic engineers about the maximum speed limit on Highway 1. They said, “I’m not sure what the speed limit was when it actually opened in 1964, however I do know it was posted at 70 mph for quite some time and was changed to 60 mph/100 km/h in the mid 1970s (as a fuel conservation policy) due to the Arab oil embargo that hit North America during that time period. This is great! I would love to see Creston to Cranbrook, it would be interesting to see how much the road has changed since then. Thanks for the feedback Wanda – we will put it on our list! Would really like to see a segment with crossing the old Alexandria Bridge. I’ve visited it, and want to know what the road beyond the West end of the bridge looked like. Unfortunately our footage only goes back to 1966, which means that the old bridge would not have been captured. You might be able to search for some images of the old road alignment online and if we find anything, we will share online. Thanks for your comment! I watched this and shared it a little while back, I would love to see one on the Creston cutoff between Salmo and Creston if there is one. I remember it as a boy, also Salmo through Crawford Bay to Creston! Glad to hear you enjoyed it Robert. We will put Creston cutoff on the list! This photolog from Lytton to Lillooet is amazing even the one from Merritt to Spences Bridge, thanks for the view and the much needed upgrade for Hwy 12, so thankful for keeping travellers safe. Glad you enjoyed the photolog, Wolfgang! Thanks for your acknowledgement of our efforts on Highway 12. This is amazing. I also like looking at the age and amount of cars on the roads in those days. Being 65 those Dept of Highways orange color trucks seem like just yesterday they were around. Hope you can get some footage of the road from Trail to Rossland and Christina Lake to Grand Forks. Thanks for putting this photolog video online. Hi Steve – thanks for your kind feedback and your suggestion. We will put those spots on our list of to do’s – so stay tuned.